Do you want to socially network while buying a soda from a vending machine? Pepsi thinks so. The company is introducing a new social vending machine system that lets you interact with Pepsi and your friends while purchasing a carbonated delight from the machine. The vending machines allow you to send gift beverages to friends via text message, giving them a code that they can then enter in the machine to receive the drink. When it comes time to redeem the beverage, your friends will then be given the option of passing the beverage love along with another gift. "Our vision is to use innovative technology to empower consumers and create new ways for them to engage with our brands, their social networks and each other at the point of purchase," said Mikel Durham, Chief Innovation Officer at PepsiCo Foodservice in an interview with TG Daily. "Social Vending extends our consumers' social networks beyond the confines of their own devices and transforms a static, transaction-oriented experience into something fun and exciting they'll want to return to, again and again." The machines also support something called "Random Acts of Refreshment," where you can purchase a drink for a stranger, or send free drinks to a machine in a certain area – for instance a high school during a record high temperature day in summer. 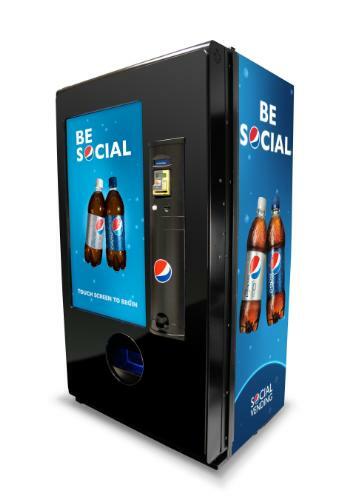 Pepsi's social vending machines will be officially revealed at the National Automatic Merchandising Association's One Show in Chicago, April 27-29. What do you think about social vending machines? Could you see yourself sending and receiving drinks through them, or do you think Pepsi is going a little too far?